In Chinese cuisine, steaming a fish is the best way to showcase the freshness of a fish. 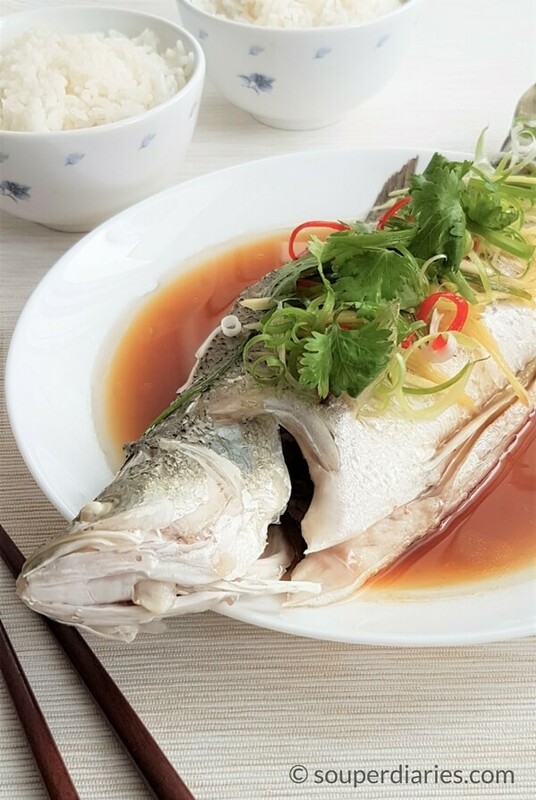 A classic and popular dish, this Cantonese style steamed fish is a fast and tasty way to prepare any type of white fleshed whole fish or fillet. It is a must-have dish for many families during the Chinese New Year as fish (余, yu) signifies abundance and affluence in Chinese culture. The quick steaming method to cook this fish results in moist and tender flesh and the sauce has an umami fragrance which just makes you want to eat more rice. In Chinese cooking, ginger and spring onions are used to eliminate fishiness so they are important ingredients in this dish. Also, don’t skip the garnishes. They really enhance the enjoyment of the dish. Although this is a very simple dish to cook, it requires some techniques to get the perfect steamed fish. Fresh fish have the following attributes: clear, shiny and bulging eyes, bright red gills, shiny and firm scales, firm and wet flesh (not slippery). The mucus covering the fish should be glossy and transparent. Try to get live fish if possible. If not, steam the fish on the day it is bought or within the next day. Steam on high heat for about 8 minutes for small fish (below 500 g) and 10 minutes or more for larger fish. The fish is cooked when the flesh flakes easily and does not stick to the bones and the eyes are protruded. Getting the timing right will ensure moist and tender fish. Do not overcook the fish or its flesh will turn hard and dry. Set a kitchen timer to the time required. Keep seasonings to a minimal. The main objective of steaming is to taste the delicate sweetness of a fresh fish. The sauce serves to enhance the enjoyment of the steamed fresh fish and not to overwhelm or mask its taste. Many Chinese steamed fish recipes call for rock sugar to be added in the sauce. I personally prefer it without sugar so I’ve omitted it in the recipe. But feel free to add a little sugar if you wish. After steaming, the water that flows out of the fish (especially whole fish) is murky and fishy and should be discarded. Pour away the cloudy water after steaming. When I steamed fish in the past, I did not discard the water and the resulting broth was slightly bitter tasting. Get all your ingredients (sauces and garnishes) ready before steaming the fish. You’ll need to have the garnishes on top of the fish before pouring hot oil over it. Steamed fish is one of my favourite ways to cook a fish. It is fast, simple, healthy and so tasty. You don’t have to go all the way to a restaurant to enjoy a restaurant-style steamed fish and it is also much more cheaper to eat it at home. Another popular way to steam a fish is this Teochew style steamed fish which I also enjoy immensely. Both Teochew and Cantonese are dialects of the Chinese. If you’re new to Chinese cuisine, I recommend that you try this method of steaming first as it is easier to prepare, uses less ingredients and tastes lighter. On a sidenote, I have to say that I didn’t enjoy making this post much. 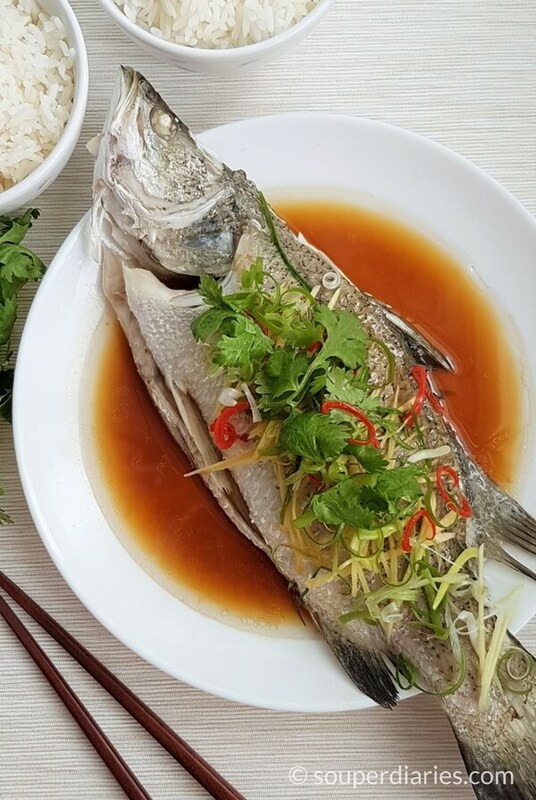 Steamed fish is best eaten as soon as it’s cooked when it’s still hot. So it was quite torturous to photograph this fish as I wanted to eat it already. It looked so tempting to just dig in. Haha! I like to make this a complete meal with a side dish of vegetables such as Chinese broccoli with oyster sauce and a nourishing soup. A healthy and delicious Cantonese-style steamed fish recipe with soy sauce dressing. 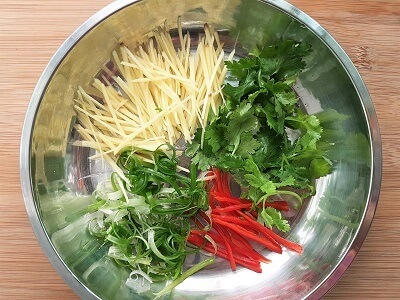 Garnished with ginger strips, fresh spring onions, chilies and Chinese parsley. Clean the fish (Gut and scale. Get a fishmonger to do it to save time). Wash the fish and pat dry with a paper towel. Make a slit under the fish and stuff spring onion and the ginger slices into the cavity of the fish. Skip this if using fillet. Place the fish on a plate. Pour shaoxing wine over the fish and set aside while you prepare the rest of the ingredients. Prepare the sauce ingredients in a bowl and set aside. Fill a wok or large deep skillet to about ⅓ full. Place a heat resistant trivet in the middle. Bring water to a boil. Once boiling, carefully place the plate of fish on top of the trivet. Cover and steam for about 9 - 10 minutes (depending on the size of fish). The fish is properly cooked if it can flake easily without sticking to the bones. Set a timer to prevent overcooking. As soon as fish is ready, turn off heat and remove plate from wok. Carefully discard the fish water. Use chopsticks to remove the used ginger and spring onions. Lay the chili and garnishes (except coriander leaves) on top of the fish. In a smaller saucepan, heat up cooking oil till very hot. Pour it over the fish. You should be able to hear a sizzling sound. Put back the saucepan on the stove and heat up the sauce ingredients. It should bubble immediately as the saucepan is extremely hot. Pour the sauce over the fish. Put the rest of the coriander leaves garnishing and serve immediately. 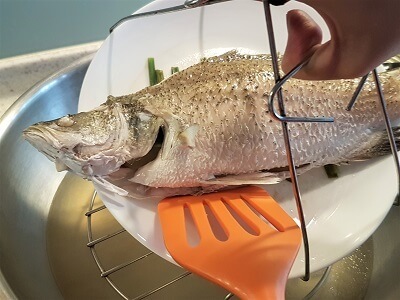 If you plan to transfer the steamed fish to another serving plate after cooking, place some spring onions on the steaming plate before putting the fish on top of them. This is to prevent the fish skin from sticking to the plate when you lift it up. It looks very delicious… I feel like having fish immediately. Well, I know it takes time but I will try to follow your advice. I enjoy eating fish, and I think it is very delicious in every form of cooking. My mom used to cook a soup with white fish, and I still remember the taste. Thank you for the detailed description of the preparation process, and attractive pictures. It looks manageable even for me – I am not a great cook. Thank you again, it is very informative and useful post. I hope you’ll try out this Cantonese-style steamed fish recipe. Just follow my tips to steam the fish and you won’t go wrong. Hi there! I have to say I’ve never attempted a cantonese dish before but with this easy to follow fish recipe and beautiful image, it just might be possible! Thank you so much for putting this out here for us to see and follow and I will definitely be looking forward to more recipes. I have to go to the supermarket and gather my items! Love your recipes Yvonne! I do a lot of Asian food cooking myself and am always trying to discover new recipes. Your description is so detailed and so easy to follow! I’ll definitely try this dish out this week! Thank you for the lovely recipe and easy to understand instructions. The fish is beautiful and I wanted to eat it too! I love the lightness of your cooking style and how attractive your dishes are. When I lived in San Francisco, I had a wonderful kitchen and took cooking classes. Reading your wonderful blog makes me lonely for that time in my life. Hi Yvonne I have never in my life attempted to cook Chinese cuisine. Love to eat it though. Actually your recipe does look rather easy to make so If I get adventurous I might make a stab at it. I see you are using a wok to steam the fish what about using one of those electric steamers? Hi Maureen, I’m not sure how big is your electric steamer. If you can fit a whole fish inside the steamer I guess you could use it. Otherwise, try this recipe with a fish fillet. Hope that helps. I love fish, I think I’ve tried every fish dish except this one, very interesting method. Does the ginger give it more flavor or you use it to diminish the fish scent? I like the idea of the steamer which I believe makes it softer. Definitely will be getting more recipes, thanks, Yvonne. Hi Tamara, the ginger helps to minimize any fishy smell. Yes, a steamer is very helpful to have in the kitchen. If you cook a lot of steamed foods, you may wish to check out these steamers on Amazon. Thanks for writing in. Hi, Yvonne, im a cantonese living in Cananda, so i loveeee steamed fish! However, there are basically fired or stired style fish here, you barely can find a restaurant where make steamed fish. I noticed that you put some gingers on top, it’s great, cuz my mom told me that could remove the fishy taste ( or fishlike smell ). I love your recipe, very simple and authentic chinese style! That’s great. I really like the way you listed all that content it looks great. Thank you for making this site and making my life better. Now I know where to look for recipes. I love coming to your site. Everything you share looks delicious! When I first saw the photo for this recipe, I jumped a bit at the site of the fish. Lol. But then I saw how beautifully garnished it is, how nice the overall presentation looks, and thought about how much better the fish would be steamed and presented that way. For someone who likes that sort of thing … what a great recipe! I really like how you lay out your articles and recipes. Keep up the great work! Omg yum! I’ve never really steamed fish before, but it looks so good. I don’t have a steamer, but could I possible bake in the oven, on a roasting rack and cover with tin foil. Would that have the same affect? No, you won’t get the same results as steaming and baking are two entirely different forms of cooking. To steam food without a steamer: Fill a wok with some water. Make a makeshift steamer by putting a small bowl upside down in the wok. (The bowl keeps the food above the water while you steam). Then carefully place your plate of fish on top of the bowl. Cover and steam. Thanks for the recipe! Looks delicious. I’m not a very good lol so I’ll ask my mother to help me with this recipe. I like new things and I haven’t seen this before. Normally I prefer fried or roast fish than steam fish but after seeing your picture and it honestly is tempting and look delicious I think I should give it a try. I am drooling right now. LOL. I must say that your food photographs are amazing. I can almost imagine the taste. I think I might try out this recipe. I live in a coastal town and we always get really fresh fish at good prices. Thanks for the tip on not using to much seasoning. Whenever I prepare fish I make the the mistake of using too much seasoning. Thanks for the post and I love your recipes on your site. And hello from sunny Malaysia! Steamed pomfret is one of our favorite dishes. My wife uses a steamer which I bought for her and it comes out just awesome! The fish can be expensive here if you don’t buy from the wet market. I’ll need to ask her if she uses sugar that you mentioned in your recipe (which I am going to print off and give to her later tonight). I lived in Singapore about 6 years ago, in the Choa Chu Kang area (sorry if spelling is wrong) and I used to eat at the hawker centres quite often. If you eat elsewhere it can be expensive. Even Malaysia is getting more expensive when eating outside so I can appreciate your recipes. Let me guess, you learned from your parents? Thanks for writing in. I LOVE using a steamer and it is absolutely an essential item for me in the kitchen especially for cooking Chinese food. I didn’t use any sugar in this Cantonese steamed fish recipe as I prefer a savory than sweet sauce for fish. I used to reside near Choa Chu Kang (yes, you got the spelling right!). In Singapore, there’re lots of delicious hawker food and I’m sure in Malaysia too. My late mom wasn’t really passionate about cooking (gardening was more her forte) and so was I in my teenage years. It was only after getting married that I became more interested in cooking and learnt from cookbooks and trial and error. You’re welcome Ebufi and I hope you’ll enjoy this steamed fish recipe!